Though spring is three weeks away, signs are evident in February. Frogs croke in the puddles. Birds sing early mornings in the little woods. Geese pair up and honk loudly. Fat brown rabbits emerge from holes and search for patches of grass. Buds appear on trees. Crocuses surprise me by the front steps. Day breaks earlier, just before we ruin the natural rhythm with daylight saving time. Maisie celebrated her 4th birthday in February. Actually, we don’t know when she was born. I’m told she was found on the streets of Mississippi with a litter of pups before she was rescued and restored to good health. We gave her a birth date because everyone needs a beginning. Sweet William and I watched a lot of basketball, cheering our home team. Our guys are doing well this season. With the approach of March Madness, we will wear our colors with pride. I finished a project that languished on my goals list far too long. Today black and white photographs of our families hang on the wall. Generations are represented, history is framed, and grace is revealed on faces. God has been good to us. 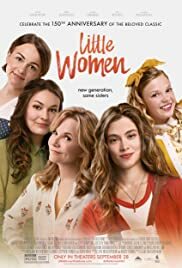 My favorite movie this month was the 2018 version of Little Women, the March girls thoroughly modern set in the sweet familiar story. Near the end of the movie, when grown sisters gather in their childhood play room, I watched, misty eyed, and wished I’d had siblings. Bathed in Prayer, Jan Karon’s latest book, is my pick of the month, and I was the very first to check it out of my library. Father Tim’s prayers, sermons, and wise counsel are grouped together according to each book in the Mitford series. 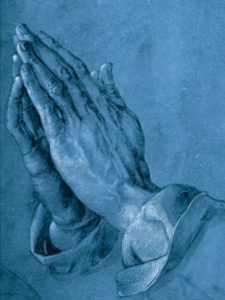 Tender and sincere, the requests seek God’s mercy and strength, with large doses of the prayer that never fails* filling the pages. I’m inspired to pray better. I cleared out a couple of file drawers that held too many papers I’d saved through the years. I went through the alphabetic folders one by one. The file marked Stress Management was full of articles and helpful technics, and I recall when my life felt stressed on a regular basis. I was always looking for something to relieve it. Thanks be to God, I’m not there anymore. I threw away the entire folder. A friend asked me to help her organize her quilting shop. She has a great space where she sews and gives classes to help people like me learn the art of making a quilt. She pulled everything out of cabinets and drawers so we could see what she had and decide what to do with it. I told her more than once that she really didn’t need to keep this item or that. We decided that it’s easier to get rid of someone else’s stuff than it is to let go of our own. “Lo, the winter is past,” said the wisest man. It feels like it should be as February ends. But we’re not out of the wintery woods yet. I’m not ready to put away my warm snuggly clothes. But I can already feel my energy rising. I notice that it is still daylight when my last piano student leaves my house. Nature knows the seasons. Sometimes I think the animal kingdom has something I don’t. When the river rose from days of rain, we drove to the bridge to see how high it was and felt anxiety rise with the water. The geese on the lake across the road were not concerned. They continued to do what geese do. Granted, they don’t have the same understanding as I do. Yet I have knowledge of the holy, the God who feeds the birds and the geese, who controls the wind and rain, whose promise to be with me no matter the situation gives me reason to rejoice. I gaze at the pictures of my family on the wall, some of them I never met. There lives confirm God’s plan, His grace, and His redemption, and they have left their fingerprints on my life, in some way or another. The sound of singing is in the air, the birds sensing a change. The season of winter will pass and spring will follow. Because God has purposed it to be. He is fully trustworthy. My life is in His hands. The faith of my fathers resides in me. I have no reason to fear. I do enjoy the re-reading of a good book. This morning, it is the account in Luke of a couple of old folks with whom I can identify. The words are anciently familiar, yet they are fresh like a sip of pure spring water on a parched tongue. I opened the Book to the story of Zachariah, the aged priest, who just so happened to be chosen on this particular day for a special assignment. He entered the Holy Place of the temple to offer incense on an altar that represented prayer and petition to God. The people were praying outside while the priest prayed inside. 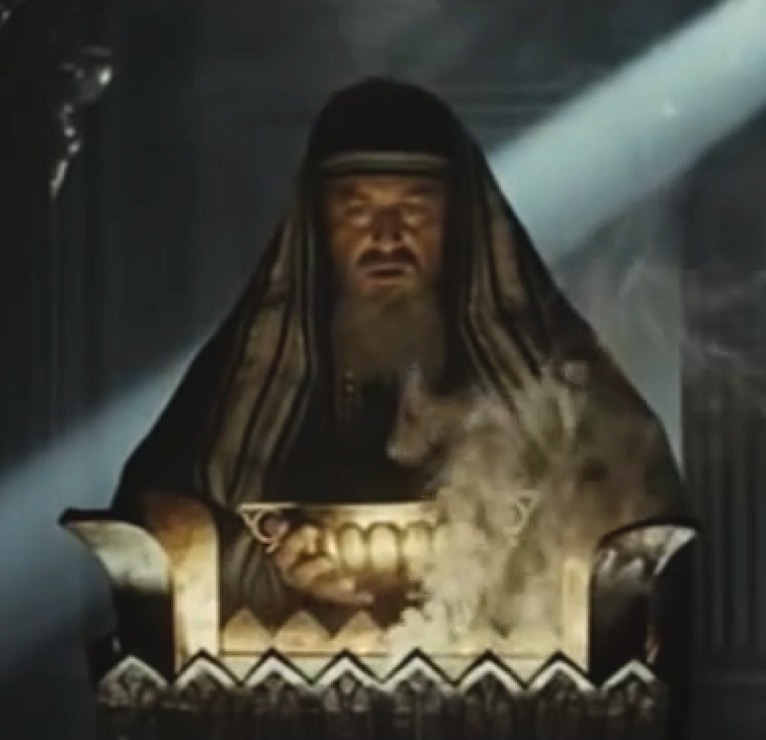 As he offered up prayers, the smokey fragrance of incense encircling him, I wonder if Zacharia thought of that one prayer he had prayed again and again through his many years? That one prayer for blessing, for a child, a son from his loins? Yet here he stood, an old man whose wife was equally well along in years, childless the two of them. Because Elizabeth was barren. God’s timing for answering prayers are so often out of sync with what I envision. Which prayer was that? You mean the one I stopped praying years ago? The one I stopped expecting to be answered because I’m old now? The prayer that would have been on a timetable more suitable for me? That prayer? Zachariah and I, we have things in common. The prayers I am grappling with sometimes grip my heart with their urgency. I cry out to my Father, my eyes filling with tears, longing for an answer. And please, can it be today? How many times have I read that God’s ways are not my ways, that His time is not my time? And yet, I want Him to do it according to my prescription and on my schedule. Faithful Zachariah and Elizabeth had lived blameless lives, following the commands God gave to His people. Surely their prayers would have been answered. Undoubtedly their desire for a child would not have gone unheeded. After so many years they must have become resigned. Head shakes and whispers behind their backs would have been hurtful. People can wonder when trouble beats us up and we are not being blessed in the conventional sort of way. God declares in His word that my requests, petitions, prayers are heard. He answers when He gets good and ready, in His own sweet time, because He alone knows when all the pieces are in place. So, my fellow traveler, don’t let discouragement weigh you down. Don’t give in to doubt and unbelief. Throw off the lie that you are forgotten and forsaken. Keep believing God. Keep bowing the knee. Keep trusting in a faithful God who hears your every plea and preserves your tears in a bottle. Believe that your prayer has been heard. In the fullness of time, and according to the perfect plan of God who does all things well, there will be an answer. And it will be spectacular. How quickly a ride in the park can turn on its heels and take you in another direction, down a dark tunnel where you cannot see the light. I put on my coat and scarf, gathered Maisie’s collar and leash to go walk. I aimed for the end of our lane where an old cedar post used to stand. It was a place my dad went to pray when trouble blindsided our family. As I reached that spot, I paused to remember. My cousins’ parents and mine moved to this piece of undeveloped property in the 1960s. We grew into adults on this lane. We added spouses and then houses sprung up, all of us living in proximity to one another. As our children were birthed, one by one, the sounds of childish play roamed these 40 acres, all the neighbors being our kin. It was unusual for sure, and it was beautiful beyond description. I think of all the prayers our parents prayed for us, sometimes when we knew it, but more often when we had no idea. The family leaned on my dad as our prayer warrior, his habits and customs unusually disciplined and structured. It was his agreement between him and his God. He called all our names in prayer daily, nightly, and he interceded when we were in trouble. He stood at that cedar post at the end of our lane on several occasions that I can remember to speak to the One who knew us well. Dad had a list with family names on it. It grew longer through the years as we increased in number. After mother’s death and his remarriage, he moved away from this lane into the house of my step-mother. Though miles away, he had a nightly ritual of going outside and turning toward the south, where we still lived, to pray for each of us one by one. I returned from my reverie of memories to the present. The old cedar post that stood as a memorial is gone. I looked about my surroundings. The fields that used to surround our homes are filled with subdivisions, privacy fences and apartment complexes. Other people live in the houses that used to be home to my family members. Things are different now. While standing where my father stood, I reminded myself that my God is the same, never altering from His awareness of us, not any less compassionate and kind. Though our parents are gone, their prayers are not. The Lord stores them and remembers the faith of our fathers and mothers. All of those words of petition did not vanish into thin air. Instead they are treasured in heavenly vessels. As tears rolled down my cheeks, I prayed too. The words that came were simple: “Lord Jesus help!” I knew He heard me just as He heard my ancestors years ago. He is a God who leans down to listen. He was not surprised by a devastating diagnoses like we were. His intention and purpose are already in place. Our family has a traditional day-after-Thanksgiving evening meal of Hot Browns to finish the leftover turkey. I asked my cousin, who hosts us, if she still wanted to do this. She answered “I think we are better together than apart.” I agreed. Sweet William and I entered the house and the atmosphere was somber, so unlike the day before when cheerful noises greeted us at the door. This night we are quiet, faces solemn. The axiom, “when one hurts, we all hurt,” is true. Before the meal we were not really hungry for, we joined hands and lifted our praise to our God who has been faithful to us through the years; who has seen us through troubles great and small; who has shown Himself huge and performed miracles we didn’t deserve; who has given grace to walk the hard places; who has never left us alone to ride out the stormy gales. We asked Him for mercy, for healing, for strength, for wisdom, for His comforting presence. Our hearts are assured He will answer our cries. This is what my family does in times of crises. We gather and we pray. I hasten to His throne. When trouble comes, family gathers. We are better side by side than trying to stand alone We hasten to God’s throne with full of assurance of His loving welcome. We will trust, believe, and wait to see what God will do. I gladly admit that Thanksgiving is my favorite holiday. That does not negate the fact that Christmas is designated as the date for the birth of Jesus, and Easter is the day I celebrate His resurrection. But those holidays have morphed into something different, something other than the sacredness of the original. Thanksgiving, however, still calls us to give thanks, to gather with our family and friends, to enjoy the bounty of a God who gives good gifts. As the day approaches, I ponder how we will celebrate this year. Our menu remains relatively the same, each of us cooking our special recipes, but there will be differences in us. Because families change. When I was young I celebrated with my parents and extended family. Me being an only child and my mother and aunt being sisters/best friends, the family units combined to make one big happy one. As my cousins and I became adults and added spouses and children to the mix, place settings were added and the house got a little louder. I asked Sweet William to take me away that year. I could not act like everything was the same, because it wasn’t. Through the decades, members of our family have been added and subtracted. More often our circle grew, but sometimes it diminished due to death, divorce, travel or a move. An open invitation policy meant we might have new neighbors, a pastor’s family, or friends needing a place of welcome. It was interesting to see who was at our Thanksgiving table. This year, once again, I long for my dear ones in a distant state. I miss my dad, gone from us five years now, and remember how his birthday often fell on Thanksgiving day. I miss others who have not been at our table for many years. We have adjusted to their absence. But we don’t forget their faces, their laughter, and the richness they brought to our lives. Friends come to mind who face the struggle of a loved one gone this year. My heart hurts with them. The first year is the hardest people say. But grief is not on a timetable. We must give place to the heartache, allow the tears to come and vent the sorrow. We need to be patient with ourselves as we work our way through the loss. Because joy will come in the morning. Thanksgiving will always be my best family holiday. There will be hugs and laughter, deep discussions and funny stories, memories and questions. After dinner, the older men will meander to the couch to watch football and maybe take a nap. The women will browse Black Friday ads, whether we intend to go out or not. We’ll talk, circling around one subject and then another, never missing a beat. The young parents will discuss politics, careers, home, and children. The kids will be on an adventure of fun. We will look around and be glad for those near. We will give thanks for those who have come and gone, remembering how they impacted our lives. We will wish for days when the entire family will be together once more. We will remember God’s faithfulness through all the years of our lives. And we will give thanks to the One who blessed us with all of this.